Kevin will be making a return to the Edinburgh Festival for one night only! 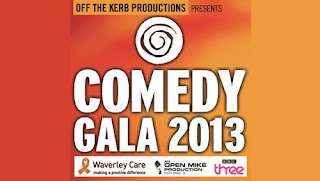 Kevin Bridges will be making a return to the Edinburgh Festival for one night only to co-host the Comedy Gala in aid of Waverley Care with Adam Hills at the Playhouse on Thursday 22nd August at 7:30pm, with an amazing line-up featuring Andrew Lawrence, Stephen K Amos, Jason Byrne, Romesh Ranganathan, Hal Cruttenden, Tom Stade, Ivo Graham, Neil Delamere, Seann Walsh, Simon Evans, Marlon Davis, Charlie Baker, Phill Jupitus, Des Clarke, Gary Delaney, Joe Wilkinson, Russell Kane, Roisin Conaty and Lee Nelson. The show will be recorded for BBC Three as a two part Edinburgh Comedy Fest Live to go out in early September. Tickets are on sale from The Edinburgh Playhouse at 10:00am on Monday 8th April. Work In Progress gigs announced!